We can unpack Maya wherever we want. I will unpack Maya in my home directory, then I will rename the folder as Maya2012. The following command will create the deb packages for Ubuntu. It will allow us to install/uninstall Maya easily. 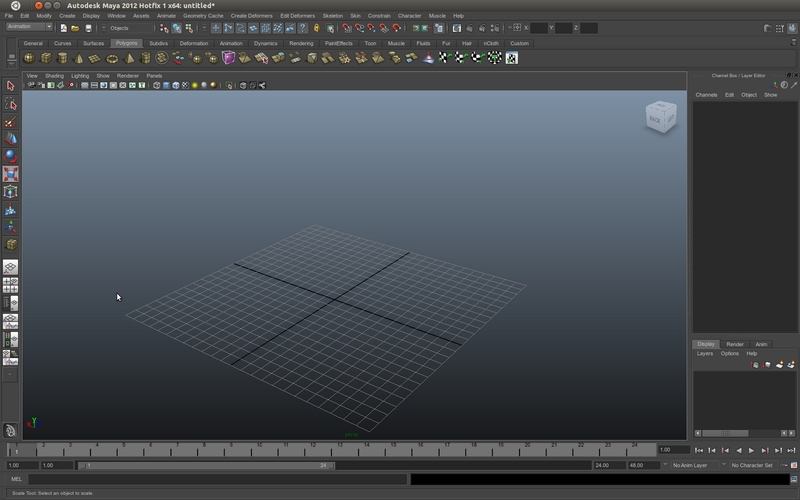 at the end of /usr/autodesk/maya/bin/maya2012. I'm not sure this step is still important for Maya 2012. For example, in my case, I don't need it. (I have an Italian keyboard layout). Now we have to export a couple of variables. to run setup (we have to follow the instructions, I have disabled dmm and backburner). Setup will create install.env in /var/opt/Autodesk/Adlm/Maya2012. in this way, when the installer will try to call /usr/bin/rpm, the process won't return errors and the exit status will be succesful (return 0;). At the end of the process, you have to delete this fake rpm and replace it with the real rpm program. First of all, we need dependent OpenGL libraries (NVidia, AMD). If you have an NVidia card, you'll find libGL.so in /usr/lib/nvidia-current and libGLw (from mesa-libGLw) in /usr/lib. Check them out. Now it's possible to run Maya. Enjoy this wonderful program.